Liquid Riot Bottling Co. is making good use of its prime real estate on the Portland, Maine, waterfront. The location is obviously good for business — tourists milling about the Old Port can’t help but stumble upon the brewery/distillery in between stops for blueberry jam and lobster-shaped lollipops — but founder Eric Michaud (who also owns the popular Novare Res Bier Cafe nearby) now has another reason for coveting the spot. On the brewery’s back porch, Michaud has crafted a special coolship, the traditional vessel used by European brewers to bring unfermented beer (or wort) back down to temperature. The rectangular metal structure is designed to allow maximum air exposure, and works like a convertible with its top down, cooling its passengers. Liquid Riot’s coolship sits in a little shed, just feet from the water, blue-and-yellow lobster traps, and a boat called the Hard Bottom. Its location is intentional, to allow yeast and other natural organisms floating in the air to inoculate the brew and provide flavors unique to the Maine waterfront. Liquid Riot brewed its first coolship batches earlier this spring, before moving the vessel aside to allow room for chair and tables for precious Maine al fresco dining. The beers will age in barrels, and will take at least a year for their flavor profiles to develop. “If you’ve ever tasted a Belgian lambic, it should be similar to that: funky, a little sour but not too sour, kind of soft, balanced, dry,” says Michaud. In the meantime, Liquid Riot’s offerings are as creative as you’d expect a Maine microbrewery’s to be. There’s Easy Like Sunday Morning, an oatmeal stout made with Maine maple syrup, and Spiritus Sancti, a Belgian quad. Delicate Funky Little Poo sounds gross but is actually a mild, balanced saison made with Icelandic heather and sea salt. 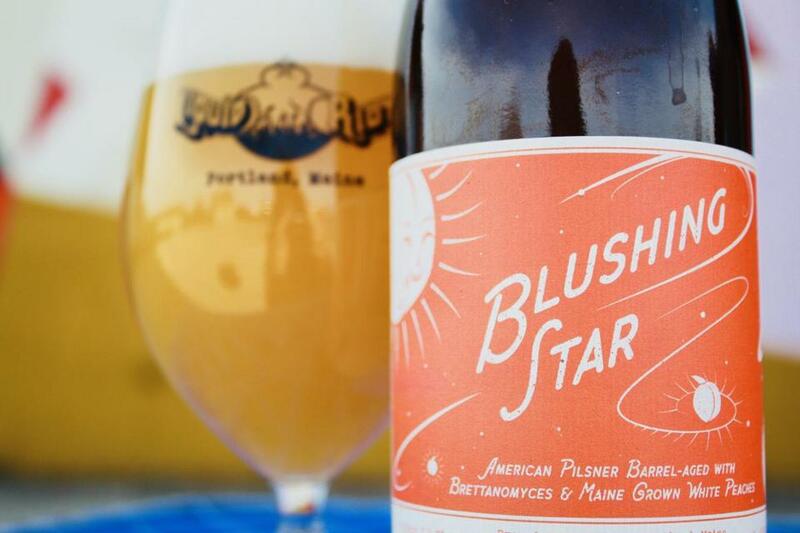 Maybe the best of the brews is Blushing Star, a barrel-aged lager made with Maine-grown Blushing peaches that’s just a little sour and provides a palate cleanser to some of the heavier brews on offer. The beer — which won the 2016 World Beer Cup gold medal in the Brett Beer category — is available in bottles to take home. Liquid Riot is at 250 Commercial St., Portland, Maine.